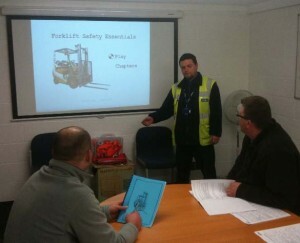 At Pro-Lift we have a team of very professional, dedicated, highly qualified and motivated Instructors to deliver all on site forklift training in the Northwest Region. All are fully insured, qualified and Accrediting Bodies Association (ABA) registered Instructor/Examiners making them specialists in their field. All on site training delivered is monitored, Instructors are required to undergo annual testing to update and improve on their on site training and Teaching Techniques also to ensure compliance with Health and Safety Legislation. Instructors are mobile and fully equipped to deliver all aspects of our Training Syllabus carrying state of the art Laptops, PowerPoint Presentations, Safety Films, Training Manuals and Course Induction Packs. Our extensive knowledge and experience gives our customers the assurance that the on site training they receive from Pro-Lift 24/7 is always of the highest standard and ensures compliance with the latest ‘best practice’ and legal requirements under Health and Safety legislation….so for all your on site training needs call Pro-Lift 24/7 today.